Online, I spend time listening, attempting to separate signal from noise. This started when I was in high school. Occasionally, I would egosurf, or search for my name on the Web. After college, when I began to use a feed reader, my listening became more routine. I could search and quickly add that search to my reader. Then, I could be lazy and forgetful--available stories were brought to me on demand. I didn't have to remember to go and find them. Slowly, I broadened the topics that I listened for, amazed that I could track what's important and not become overwhelmed. Hitting "Mark All As Read" in a reader is much, much easier than declaring e-mail bankruptcy. Currently, I listen for information about several specific areas: me, Technola, Pro Bono Net, document assembly, and access to justice (legal aid, pro bono legal services, Legal Services Corporation, and so on). Over time, I've changed these areas, refined the key words and phrases that I listen for, and pulled in new sources as they've surfaced, like Twitter and LexMonitor. Listening helps me to stay informed. 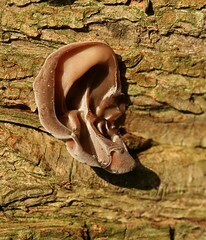 I often "hear" things that I wouldn't otherwise. Listening also gives me the opportunity to observe and participate in conversations that don't, and won't, happen in my offline life. Laura Quinn, Michelle Murrain, and Holly Ross are not going to show up at my house and talk nptech. But they do talk online, and I can meet up with them there. Listening helps me figure out where those good conversations are happening. Go to Google's Blog Search. Search for your name or your organization's name. Refine your search terms, if necessary. Do this to make certain you are getting relevant results. For example, I don't have a very common name, so I use (Katherine OR Kate) AND Bladow. But someone with a more popular name might need to be more restrictive, say ("Jonathan Smith" OR "Jon Smith") AND Massachusetts. Subscribe with your reader or by e-mail, when you are satisfied with your results. Ta Da! You are listening. If you are listening already, I encourage you to step it up: refine your key words, add a new source, or move your e-mail alerts to a feed reader. Beth Kanter - What is the value of listening to social media channels for your organization? Beth Kanter - Listening Literacy Skills: What keywords or phrases have brought you some insights? So now it's your turn. Did you take my challenge? Either way I'd love to hear about what you are listening for, what tools you are using for listening, and any lessons that you've learned so far. If you aren't listening, tell me why not. On Tuesday, September 29th, I'm participating in a social media tutorial hosted by the Case Foundation. It will be a live streamed event where folks can ask questions and get answers. Here's my guest post on their blog and the details. Meanwhile, I gotta go tidy up my office. Last month, shortly after Trust Agents by Chris Brogan and Julien Smith was published, there was discussion on nonprofit blogs about how to apply some of the principles to a nonprofit context. Kivi's Nonprofit Marketing Blog wrote a review of the book and offered a summary of the four principles in the book that she thought nonprofits could apply. Frank Barry chimed in with a follow up post illustrating trust agent characteristics with nonprofit examples. I republished the post on my blog and offered a free copy to a nonprofit who left the best comment about how their organization is applying these principles. Bethany Deines and Besty Woods from the The Children's Medical Center of Dayton, Ohio were the lucky winners. Here's an interview with them about how they using social media part of their hospital's patient relations and communications strategies. 1.) 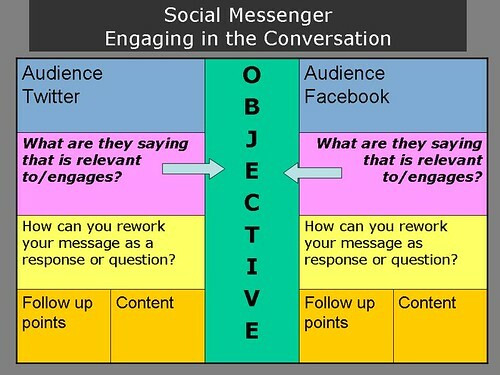 What is the objective your social media strategy? Our objective is to engage and educate our stakeholders – influential moms (18-49+), donors, employees, volunteers, new moms, community leaders, etc – through an affordable medium that reaches a broad audience. Our social media strategy is an integral part of our overall marketing and public relations strategy. We always have to be thinking of new ways to connect to our stakeholders, communicate with them, then listen and respond. We are also looking for methods that are interactive and help us form trusting relationships with those various constituencies. We (marketing and development) already knew the power of viral marketing through Twitter, FB and You Tube, but we had to back it up w/ research to prove it to our directors and senior management team. We started using You Tube, FB and Twitter – saw the positive impact it had in getting our message out and then told senior management about it. They LOVED the idea and many of them joined social networks to see first hand what we were doing. Our organization has a culture of being able to try new things in low risk experiments. What we do is tell the story about how and why it’s working. That gets us further support to continue our efforts. 2.) How does your strategy support or enhance other communications/fundraising channels? We post content (safety tips, flu tips, event information, etc.) that already exists on our website or are media stories from local media outlets on our social media channels like Facebook. Our ultimate goal is to drive traffic back to our website. Social media is just another avenue to tell our story and get the word out about what we do and educate the public (both locally and nationally). Social media brings attention to our fundraising campaigns to an audience we might not be able to reach otherwise. We very successfully used Twitter and Facebook during our Telethon to post updates. This increased our online giving significantly. 3.) How do you measure success? Finding hard data in the ROI of social media is difficult. We measure success by the number of fans and followers we have but also by the quality of fans and followers (# of people that share our message, comment on a story, etc.). We also share comments from followers with other people on staff and often include quotes or mentions in our e-newsletters. We regularly share what people are saying about our organization with senior management or individual departments mentioned. 4.) Does your hospital have a social media policy? Yes, we do. The only concern was potentially violating HIPPA laws. However, we were already mindful of HIPPA laws and have existing protocols and policies - so we just made sure we followed those in our social media use. I also researched other social media policies and read up on what others were including and advising people to do – again, Twitter was a GREAT resource for this to learn about what others were doing in the non-health care world. The risk manager had a concern that someone would write something negative about us. We had a discussion about how using social media was another form of providing excellent customer service and listening. Often times we find if someone says something negative about us, many fans/followers immediately respond about why the negative comment isn’t true and do our job for us. 5.) How do you build relationships and engage with your audience with social media? We don't like to stream content on our Facebook Page or Twitter feed. There are two marketing staff members and one person in the development office who share the responsibility of interacting with our fans on Facebook and our followers on Twitter. We are known for putting a human face on our social media. Many fans and followers have told us that they recommend us to others based on our interaction with them on social networks. Social media can generate good word of mouth - if you take the time to build relationships. It’s all about listening on social media and responding as a ‘real, live’ person. So many organizations have “ghost” tweeters or people that just send out a blast of information but you never hear anything in response. We (development and marketing) respond to questions, comments and thank people for their kind words or sharing their story. Social media is two-way communication. It’s not just putting messaging out there and hope it sticks. Messages should be relevant, timely and interesting to your audiences. There’s a local mom from the Beavercreek, Ohio area on Twitter and she has followed us for a few months. She replied to a posting I put up about our new urgent care in Springboro and said how wonderful it was and how much she loved Dayton Children’s. I of course responded with a thank you and asked her where she lived and how many kids she had and what her experience had been at Dayton Children’s. She’s one of those “influencer moms” that you want – has a mommy blog, active on Facebook and Twitter and will tell everyone if her experience was great or horrible. We ended up meeting her and did an interview on video we produced for our "A Minute for Kids campaign." She has become a HUGE advocate for Dayton Children’s and will tell everyone she knows about us. 6.) If you were to offer some lessons learned to others just started off with social media, what would be your advice? Sign up for Facebook and Twitter now and just start listening to people. Follow other similar organizations, find out what they are doing (what’s working, what’s not), talk to other marketing professionals, research and read articles on social media. Be willing to change and have a new outlook on marketing, public relations and fundraising. Be willing to try something new and don’t be afraid of failure. 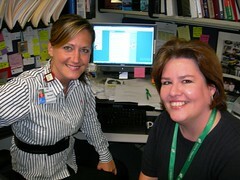 We, Dayton Children’s, knew we HAD to be involved with social media and just started doing it - that’s how you learn. Don’t be afraid of people that will say negative things about your organization – use social media as another tool to improve customer service. Negative comments is a matter of when, not if. It WILL happen, but if you respond and fix the problem, you will have obtained a very loyal fan/follower/customer, etc. Be willing to invest a certain amount of time daily in posting information. You can’t create a Facebook page, YouTube channel or Twitter account and them let it sit idle. Conversely, you can’t go overboard either and post so frequently that your audience begins to tune you out. Yesterday at the Packard Foundation, as part of a series of "deeper dives" to learn about networks and social media, Eugene Eric Kim of Blue Oxen Associates gave a talk about "Networks in an International Context." I've gotten into the habit of asking if there will be confidential information shared and what is or isn't bloggable. This makes me more comfortable for me to open my laptop and take notes. Eugene said at the beginning that he would not be sharing any confidential information and that everything is open. I asked if I could live tweet to bring others into the conversation which I did using the tag #packfound. Eugene was the consultant on Packard Foundation’s Organizational Effectiveness grant to strengthen the network of a Population/Reproductive Health grantee, The International Institute of Education's Leadership Development for Moblizing Reproductive Health Program. More than one third of Packard Foundation’s grantees are networks and many more get their work done through networks. The Foundation’s Organizational Effectiveness program has long supported projects to help Foundation grantees improve management, governance, and leadership. But over the past two years, the program has expanded its work to include a focus on how grantees can improve the strength and use of these networks. Since 2000, the Institute of International Education has worked on leadership development with the goal of building and sustaining networks of leaders who would improve the delivery of family planning and reproductive health outcomes through improved services and policies. There are now 990 actively engaged Fellows—across the five focal countries of Ethiopia, Nigeria, India, Pakistan, and the Philippines—regularly participating in the Leadership Development for Mobilizing Reproductive Health network activities. The focus of Eugene's work with this network was to better understand its community, the most promising group practices, and have an open discussion that would facilitate learning and interaction among these leaders who were miles apart, spoke different languages, and had Internet access challenges. With the entire network engaged, the leaders worked together to create a report to document the lessons they were learning from implementing leadership programs for reproductive health, through a new wiki. Eugene Eric Kim is an expert in online culture and collaboration, particularly with new tools. He is currently facilitating strategic planning for the wikimedia movement. His work was recently profiled in this New York Times piece. This session was particularly exciting for me because I got to meet Eugene Eric Kim face-to-face. I've known him through his "Twitter ant trails" (I'll explain that in a bit). Get in a circle. ask each member of the circle to pick two people, but don't tell them. When facilitator says go, everyone moves so that they are always equidistant between those two people who they chose. Repeat the exercise, this time with the goal of moving one person to the opposite side of the room. One person is identified to move to the other side. Everyone again has two persons with whom to remain equidistant. By moving others move - the aim is to impact the person who needs to be moved to the other side. I had attempted to use my FLIP camera to document us doing the exercise, but I found myself so engaged in the learning versus the documenting, that I only got one clip at the beginining and it was so great. On Eugene's site, you can see a much better video of the exercise with participants in Africa. Having a shared goal can really catalyzed the group, without it you get interesting random behavior. Trying to accomplish our personal goals the first time we did the exercise was playful, but chaotic. We decided to ask each other who we were following, we quickly were able to fall in line. We had different strategies for accomplishing our personal goal and the group goal. Doing the exercise two times gave a sense of confidence the second we did it. We knew what was coming. Getting involved in a movement exercise that includes having people reflect on their individual and the group behavior was really valuable - this relates to the title of the exercise - that network leaders have to be on the dancefloor (or in the weeds) and then get up on the balcony and observe the patterns. We came back in side and Eugene Eric Kim did a fantastic presentation offering up excellent principles. His slides and my notes and reflections follow. View more presentations from Eugene Kim. As a prelude to his talk, he asked to think about to take a moment to think about the best experience you ever had collaborating with other people. He asked us, "If you think about the best experience, imagine a world that all your collaborations is at least as good as the best experience you ever had?" That's the vision for his company and work. He has deep experience with emergent communities, groups of people that have a loose network that come together to form their own groups, not meeting face-to-face but doing amazing things. This is the way I've described the Nptech Tagging community and other ad-hoc communities where people come ogether first through social media tools. His focus is on emergent collaboration and understanding what the how to create the conditions to inspire action and learning. He talked about the importance of individuals having a "learning attitude" - that is someone who thinks about things and takes lessons away - regardless of the teacher. (I might also add regardless of whether or not the experience was a "success"). He also talked about collective intelligence as the group ability to learn and improve. He then gave us Five Principles to Think about Networks. What I loved about his frameworks is these can applied to social media work for external communications plans and even inward facing work. These are particularly important for International Networks made of people speaking different languages and having different cultural norms. Eugene shared his experience going to a developing country for the first time. He mentioned that he ad done a great deal of research. He was asking his local guide a lot of questions about what was and what wasn't appropriate. He shared that he was not only jetlagged, but "freaked out" because didn't want to make a mistake and break etiquette. His guide in country turned to him and said, "Be yourself. You'll make mistakes, but you'll learn. People will understand." He mentioned that he did, in fact, make a mistake. He didn't bring a long sleeve short in the dessert because it over 100 degrees. However, the local culture was to cover your body up. Eugene related this to working with international networks, "There is a chance to screw up in the projects, but you can't go in with that mindset. You're going in with good intentions, be self-aware, and people will accept that. Do your due dilligence, but go as a learner." Everyone is people. That's a challenging notion for thinking about networks. "We visualize networks in a different way. Critical to remember that networks are piles of people who have a relationship with each other. When you talk about catalyzing learning, action, or collaboration - what makes networks is the relationships between humans. What makes it hard is that our assumptions about people isn't always correct." Technology is a dehumanizing. Our interaction with technology makes us reorient ourselves around the tools, not the tools serving us and bulding relationships. Online network work in general is people work. We can't forget about our basic humaness when interacting with other people. He talked about how culture manifests itself in online collaborations. He pointed to the Japanese wikipedia page noting that in Japan, the cultural norm is for the group to discuss the page in the discussion area before developing the content together. In Western countries, people dive into collaborating writing first and then use the discussion area to settle differences of opinion. With international networks, it is important to recognize cultural norms both online and offline. He emphasized the importance of actions to garner trust. It made me think of Chris Brogan's "Trust Agents." He talked about how in Nigeria everyone has a "money guy" who can exchange your currency. The reason is that the banks usually rip people off. He asked his guide how they find a money guy who told him that they get referrals from friends and family and based on how your treated. You have good faith upfront and then it depends on how you're treated. Kim said it is very important to understand the trust norms in different cultures and how these translate to an online context. Online networks and collaboration happen if participants have some sense of trust through previous relationships, play, or past experience. "To catalyze the network, you have to invest in relationships." He pointed out this plays out differently depending upon the life cycle of the network. For example, networks just getting started, need to build social lubrican of trust and this happens through relationship building. "Relationships are built over food and drink." He also said that we can't go into using social networks thinking we're going to see the tangible results because the first focus has to be on this relationship building. "If we want to do something amazing, we have to start with building relationships first. Eugene talked about the importance of modeling to create. "You have to set an example and it only takes a few people to do that and it seeps into the group." He suggested that a biggest value of my participation at Packard as visiting scholar, was modeling how to be connect with professional networks via social media - the blogging and twittering that I'm doing. He used the example of the recent NetFlix prize as an example. Observation - see the whole - allowed us to shift the behavior. To create an environment where the network can learn from each other requires intentional modeling. He used the metaphor of the ants. They do two things leave and follow trails and haul things. They basically leave a trail that says "I was here." That way others can find them and connect. He applied the metaphor to Twitter. Twitter is simply an ant trail. We can leave a pulse, it is simple and easy. It keeps the connections going. Eugene said not to focus on the content. Leave a trail and emergence to happen. This was all about giving up control - networks work when you give up control. How much are you giving up control and seeing what happens? I left this session with some new insights about the networks and social media tools. Networks can exist as part of your external communications strategy, your outward facing work. That's a lot of what I write about on this blog -- crowds, groundswells, and movements. Emergent collaboration takes place when your supporters remix your content and share with their friends. There are also networks that are very bounded - where the people are known and the work they are doing together is confidential. These principles apply to their work, but it doesn't happen out in the open where anyone on the Internet can see it. There is controlled access. The group can use some of the social media, if appropriate, to do its work. And then there are the networks - that are coming together for learning and improving and do their work out in the open. The goal is not an external communications strategy. What I wonder is how and when a network that is coming together to learn and improve decides whether it can open or needs to have a gate or password protected space. What are the cultural shifts that need to occur? When does being completely open disrupt or impair the learning and improving part? As many of you know who read this blog, I am an early adopter of social media and set up my listening post 5 years ago to scan for people, trends, and ideas related to social media and nonprofits. Listening and engaging with people has been critical to any success I’ve achieved as a social media practitioner. For the past five years, I’ve been teaching social media workshops for nonprofits and lately doing deeper dives on the techniques of listening both for nonprofits and in my role as Visiting Scholar in Residence at the Packard Foundation. Today, I had the pleasure of co-leading a deep dive on listening with practitioner, Wendy Harman, from the Red Cross for NTEN's WeAreMedia project. Last month I wrote a guest post for Brian Solis titled "Listening Literacy for Nonprofits" which outlines some of the basic how-tos. But that was last month's thinking, the Webinar gave me a chance to reflect and incorporate new learnings, particularly with some of the professional tools. Doing a living case study with Wendy Harman provided a chance to catch up her current practice. At first, it may seem like trial and error - but after you get familiar with the lay of the land, you know which keywords give you bang for your buck. It's always a delight check out what people have added to the Wiki. There's a new free listening tool in the tool box section! SociafyQ provides free data analytic tracking for services including Facebook, YouTube, Twitter and more - accessible through a web dashboard, XML and Dashboard and Yahoo! widgets. In terms of process, I really liked the opportunity to have so many experts/practitioners on the call and have different voices answer some of the questions. For the breakout sessions, we had a few technical glitches, but kept rolling with the punches! I know it must have been intense for participates to take this deep dive, but left great learning artifacts that participants came back to and a whole community of people on the WeAreMedia wiki. I'm getting ready for the WeAreMedia Webinar, a deeper dive on listening, and have been thinking about how you analyze what you hear and apply it. Also, how to avoid what Holly Hight at Project Bread last month - getting past command and control messaging. I just happen to notice a Twitter follower, David Lipscomb, who retweeted this great find from the McKinssey. I browsed David's site and discovered his excellent communications planning templates and riffed over his social messenger framework. So, the idea is that you do your listening and engage, but you think about how your engagement supports overall communications goals. This can be done with direct replies @ on Twitter or hashtags. For example, take a look at what EDF has put together. 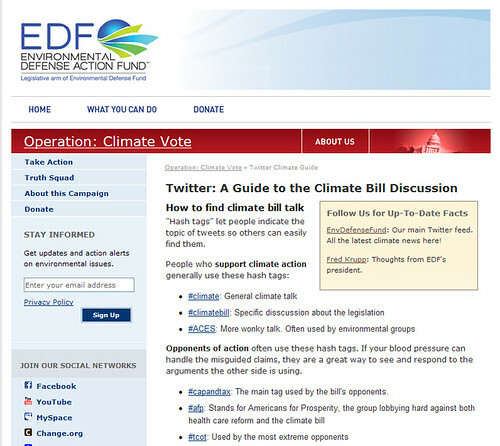 It's a Twitter Guide to the Climate Bill Discussion. The guide points out the hashtags used by people who are supporting the bill or against. It also provides some "tweeting" points for advocates to use. All based on listening to what those who are against are tweeting. 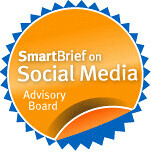 Does your organization have an example of strategic tweeting that is social? Guest post by Brian Reich: GamesThatGive - You Play. We Donate. Charities Win. I am super excited to tell you about GamesThatGive. GamesThatGive is a new company that creates casual video games (Solitaire, Sudoku, etc.) where you earn donations for your favorite charity, for free, just by playing. I joined the team a year ago as an adviser, charged with recruiting charities to be a part of the site. I now serve as the company’s ‘Principal Evangelist,’ which means my role is to help introduce GamesThatGive to the world. My goal with this post is pretty simple: I want to convince you that GamesThatGive has the potential to change the way charities use the internet to engage audiences and raise money. Before I go any further, I want to be really clear: I have a personal interest in seeing the company succeed. I am a member of the staff (though my day job continues to be running my own communications strategy shop, little m media) and I ‘own’ a (very small) part of the company. Even if I didn’t have a role in the company, I would tell you that GamesThatGIve is the real deal. I have been providing strategic support to charitable organizations about how to use the internet and technology to engage, educate, and ultimately mobilize audiences – and especially raise money online – for almost a decade. I have seen hundreds of ideas for new tools and technologies designed to help raise money for charities, none of which ever lived up to the billing. I have seen millions of dollars and countless hours wasted by organizations looking for a magic bullet solution to how to thrive in today’s connected society. So I think I have a pretty good sense of what works and doesn’t work. This is not some crazy idea or gimmicky technology solution. I wouldn’t have signed on to this project if I didn’t think GamesThatGive was something special. 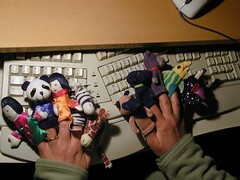 - You log on to www.gamesthatgive.net and start playing games. - GamesThatGive charges sponsors to advertise in the games, and 70% of that advertising revenue goes directly to the charity that you’re playing for. - The better you do at the games, and the longer that you play, the more you donate! - That’s it. No catch. 1) People are already playing casual games, in big numbers, and for long periods of time. GamesThatGive is simply seeking to tap into that existing behavior to help raise money for charity. - The more people log on and play, the longer they play for, and the better they perform at the game, the more donations they generate for the charity of their choice. - Nobody wants ads ruining their game experience, so we make sure they don’t. Only one advertiser sponsors a player’s game experiences per session – that means one corporate logo appears in the background of each game. And the charities get to choose whether to receive support from an advertiser… if they don’t want a certain ad to appear alongside their brand, it doesn’t. - Throughout the site, and embedded into the game experience, messaging is delivered about both the charities and the advertisers. Nothing is permitted that will interfere with the player’s enjoyment or play. But, in addition to learning about the mission and focus of the organizations that are partnered with GamesThatGive, users are able to learn about – and see firsthand — the impact of the donations they are helping to generate. These organizations aren’t just well known - they understand the potential that casual games offers, and want to explore new ways to delivering messaging, developing relationships, and generally supporting the people who are supporting them. Perhaps most importantly, GamesThatGive has decided to keep the number of charities on the platform at any time limited. We have learned from the mistakes of the social and online platforms that have come before us, and we will not dilute the money raised by having too many charities participating. Charities are selected for their diversity and for their support of this innovative approach to fundraising. And while nothing is required from the charities, they know that by encouraging their audience to participate, they can raise more money to support their work. That’s really it. I am confident that GamesThatGive can raise a lot of money, and I truly believe the model behind GamesThatGive will help change the way organizations look at how to use the internet and technology to raise money and engage their audience. Before we can change the world, however, we need something much more basic: you to play a game. So please, log on to www.gamesthatgive.net and start playing. 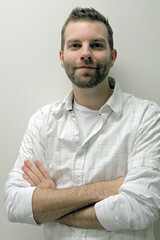 Brian provides strategic guidance and other support to organizations around the use of the internet and technology in order to facilitate communications, engagement, education, and mobilization. He is the author of Media Rules! : Mastering Today's Technology to Connect With and Keep Your Audience (Wiley 2007), and writes/speaks/works regularly on the issues involving the impact of the internet and technology on politics, society, and the media. Are Happiness and Generosity the Future of Marketing Campaigns? Last winter, a report "Generation Generosity" predicted that corporate greed would be replaced by generosity and a little love and happiness too. Seems like generosity comes in shades of green too. Two different green campaigns were launched this week with different objectives and strategies. The first is an environmental activism campaign using positive messages and creativity to advocate for the Climate Bill. The other one a campaign that promote's one corporations green initiatives and corporate social responsibility efforts. What did they have in common? Love and generosity as themes and user-generated content goals. 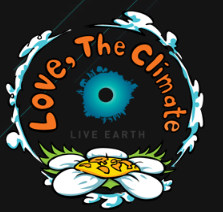 Live Earth has just launched an awareness campaign, Love, The Climate, to engage the public in environmental activism and contact their senators about supporting the Climate Bill. What's different about the tone of this campaign is that it using happiness, love, and optimism as the core drivers. Live Earth is soliciting positive and supportive user generated content expressing appreciation and love for senators’ positions on the environment, green jobs, clean energy, and/or the Climate Bill. They are urging us to encourage and motivate them to support a greener future. Live Earth is giving us a permission to be funny, enthusiastic and creative by contributing a video or photo expressing our love for the climate. Leave a voicemail thanking a senator for improving the world and letting everyone know how much you love the climate. Call 347.422.6392 now to leave your message on the Live Earth message line (this is not a toll-free number) or go to Live Earth's site and they’ll call you! Live Earth will highlight the best voicemails on their website and forward the best ones to the senators to whom they’re addressed. Add to the “Love, The Climate” Facebook Page with a note, a message, a photo, or a link to content that shows how fantastic the climate will be after senators have taken action by passing the Climate Bill. Make a video for the climate demonstrating to senators how amazing life has become in a future where the environment is protected. Sing them a song, read a love sonnet, speak for the trees in costume, let the whales do the talking! Submit your video here. Live Earth will promote the most creative entries, and forward the best videos to the senators to whom they’re addressed. Check out the announcement video here. Need some inspiration? See Shira Lazar’s inspired contribution here. 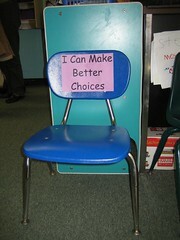 That's a chair in my son's kindergarten class from a couple of years ago. The intention was not to shame or punish the child for "mistakes" in behavior, but provide an opportunity for reflection and learning. Two weeks ago, I had an opportunity to have a discussion at the Community Roundtable on the topic "How do you create a culture that is not afraid to fail?." There were many takeaways, including providing a safe place for social media pilots. I've found that it's not just that we avoid talking about mistakes, we avoid reflection that explores all the breakthroughs we've made and never see because we're too quickly onto the next action. Here is a quick brainstorm of questions we could ask that might help networks reflect more effectively. 1.What worked really well in this project? 2.Did it accomplish goals or outcomes? In what ways? 3.Did it fall short? Why? 4.What would you do differently? 5.What surprises came up during the project? What unexpected happened? What could you learn or capture from that? 6.What insights did you get during the project? 7.What processes did you use that worked well? Which didn’t work so well? Why do you think that was? 8.How did people work together? Were there conflicts? How were they handled? Did people get any new insights or perspectives as a result? 9.Were there people or perspectives missing from this project that you would include next time? 10.What skills and processes did you help people learn as part of this project? What skills and processes would you spend time on if you did this over again? 11.What were the most innovative aspects of the project? How did they work? 12.What did you do in this project that you could transfer to other projects? 13.What is the most troubling aspect of the project? What might you do to deal with it differently? 14.What skills came in most handy during this project? What skills did this project make you realize you need to acquire? 15.What really puzzles you about this project? What are unanswered questions you have about what happened? 16.What intrigues you about this project? 17.What would you like to learn more about that would help this (or other projects) in the future? 18.Where did we mess up? Make mistakes? Fall on our face? What can we learn from this? Note from Beth: I got a review copy. I read the book. It rocked. I was going to write a review and do a book giveaway, but I stumbled upon Wiser Earth blogger Angus Parker's excellent review. If you'd like to be eligible to win a free copy of Tamar's book, leave a comment explaining why your nonprofit's community rules and your secrets to success in marketing on the social web. And, if you want to participate in the Nonprofit Social Media community, WeAreMedia, there's a Webinar next week - more here. We have read a lot of books over the last year that aimed to be the "go to" source for understanding Social Media. Finally, one stands out. Here we review, 'The New Community Rules' by Tamar Weinberg - probably the single most important book to read this year if you are involved in marketing your organization or cause on the web. Practical, readable and accessible to those just getting starting out in this area, 'The New Community Rules' is sure to become the social media "bible". It starts off with a brief introduction to what social media is, follows with how to set goals, gets into the specifics of what to do, and finishes off with how to measure your results. Tools touched on include: blogs, microblogging, social networks, social bookmarking, social news, Q&A websites, photography, video, and podcasting. At the end, there is a nice 'Ultimate Social Media Etiquette Handbook' that spells out the dos and dont's of using some of the more popular social media sites. Some points specifically stood out for me. First, Tamar makes it clear that you need to pick and choose which tools to focus on based on your goals and target community - something strangely absent from many other social media books. Then she goes further by spotlighting niche sites that cater to specific audiences, making the point that you can get a lot more exposure with a lot less effort if you use them. We Are Media - a community effort lead by Beth and NTEN to put together an online curriculum for nonprofits using social media. Since its a wiki and frequently updated it won't be obsolete like a book! Mobilizing Generation 2.0 by Ben Rigby - a nice summary of social media tools with specifically tailored strategies for the activist / nonprofit community. Here Comes Everybody by Clay Shirky - an oldy (in social media terms) but a goodie, this book is filled with great stories that illustrate the power of social media. It's a helpful frame for starting you web 2.0 exploration. Angus is the Program Director of WiserEarth. 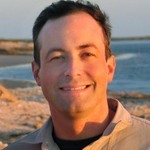 He blogs at http://blog.wiserearth.org on successful community building. WiserEarth serves the people who are transforming the world. It is a community directory and networking forum that maps and connects non-governmental organizations and individuals addressing the central issues of our day: climate change, poverty, the environment, peace, water, hunger, social justice, conservation, human rights and more. I just finished my session on ROI as part of the Online Nonprofit Technology Conference - a two-day virtual conference. I presented on ROI and Nonprofit Technology. My presentation is based on Chapter 3 of NTEN's book. The chapter includes detailed checklists, case studies, and how-to steps for analyzing ROI for nonprofit technology projects. I'm started with a very brief primer on ROI which provided a basic overview of the concepts. But the real learning came from a couple of ROI cliff hangers that I've created. Participants applied what they've learned the presentation and their own experience by the interactive features of the Webinar software to suggest ways to resolve a common ROI problem that nonprofits typically face. The inspiration was Perils of Pauline where each installment ended with Pauline placed in a situation that looked sure to result in her imminent death but was able to escape at the beginning of the next installment. I've created a couple of scenarios where IT staffers Paul or Pauline are faced with a typical ROI challenge. Episode #1; Fondle the Hammer Syndrome. His executive director wants to purchase Iphones for all staff. Paul has to use ROI techniques to help the organization make the best decision. I was really surprised that this situation resonated - one would think that with the economy - shiny object syndrome would die a hard death. But several participants mentioned they had just dealt with that problem. Peter and everyone staff has 12 monitors and have to do a lot of work that requires scrolling. Everyone is frustrated. Peter, the techie, writes a twenty page report to his executive director extolling the features of large screen monitors. His boss says, "Why should we buy new monitors, our current monitors work just fine." How can we help Peter use ROI to get new monitors? Pauline works for an organization that is using all manual systems - with an overtaxed copy machine - work grounds to a halt because important procedures/documents are hopelessly out of date. Pauline specs out an intranet by herself and her boss says, "for that money we could hire a staff person." How can we help Pauline and her organization reduce their frustration and get work done using ROI to find the right technology solution?" If you want a good laugh, watch this one-minute clip of Perils of Pauline movie. I get a lot of email and I'm looking for ways to cut back. One of the ways is to stop getting email alerts or "announcements" from many, many causes that I'm a member of. So, yesterday, after getting two announcements in a row from the same organization that should know better, I went to change my preferences but by mistake ended up leaving the Cause. Clicked the wrong button. I was surprised to see the above exit survey pop up. This would be valuable data to share with nonprofits - especially the data set for the specific cause as well as the aggregate. And, if they were a little bit more transparent - they could get some feedback about to shape this exit poll more effectively. The data would certainly help fine tune nonprofit's strategy using Causes and figure out whether email announcement blasts turn people off or encourage a closer connection. Geez, it might even help us start to look figure out some benchmarks. So I asked them on Twitter. At least they are thinking about it. Causes should create a feature where when a user donates to a cause, Causes puts something up on the screen that says, do you want to become a fan of this Cause’s facebook page? And links to it. The integration between Facebook Fan Page and Causes isn't quite there yet. I had to jump through a few geeky hoops to get a customized Tab for the Sharing Foundation on my Fan Page. 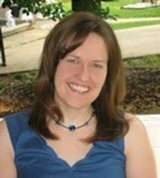 Note from Beth: Celeste Wroblewski writes the studio 501c blog. We have been reading each other's blogs for a couple of years since we are both passionately interested in nonprofits and social media effective use. Yesterday, Celeste left a comment about the Seth Godin outburst about nonprofits on my roundup post. She refined the comment as a post on her blog and she kindly gave me permission to republish it here. If you have thoughts, comments, or questions, let's discuss this over in the comments at the original post. In response to this post by Seth Godin on nonprofits and social media, I repeat what I said three years ago over at the Netsquared Community. It's what I wrote in 2006, when Godin slammed nonprofits for not using his Web service, Squidoo. Given the episode in 2006, plus Godin's response to Tom Watson about Squidoo, one can't help but wonder if the nonprofit execs that Godin cites in this week's post were rejecting Squidoo, rather than online fundraising and social media in general. In fact, a friend from a large nonprofit told me his nonprofit was treated arrogantly by Seth's Company when they refused to get involved with Squidoo -- the nonprofit leaders were made to feel stupid. And if we're talking about blowing people away, as Seth suggests, you know what would blow me away? Seth publishing a detailed report showing exact amounts raised by each nonprofit in the Squidoo program, along with case studies of the time and resources they expended. To my knowledge, detailed figures have never been published -- there are only vague statements about thousands raised. If Seth wants nonprofits to change, and if he wants them to use his product, he should start with a thorough, transparent report on the uses and results of Squidoo. Seth Godin's Non Post About Nonprofits: Deers in the Headlights? Take a look at the top 100 twitter users in terms of followers. Remember, this is a free tool, one that people use to focus attention and galvanize action. What? None of them are non-profits. Not one as far as I can tell. Is the work you're doing not important enough to follow, or is it (and I'm betting it is) paralysis in decision making in the face of change? Is there too much bureaucracy or too much fear to tell a compelling story in a transparent way? The Chroncile had a post swinging right back saying that Seth was slacking. Is a celebrity-marketing expert right when he chides the nonprofit world for being “paralyzed by fear” when it comes to the use of social-media tools such as Twitter and Facebook? Or did he fail to do his homework? Seth Godin uses the Ashton Kutcher Metric of Social Change - not yet proven, only a theory! I preach digital change to nonprofits every day. Change ain’t easy when the world keeps moving and you have the keep the lights on – ask the President. Besides, nonprofits are way, way down the list of sectors that really abhor change. Wall Street, big insurance, government – now they really hate change. More nonprofits need to adapt, to experiment, to take risks, to embrace change. But they need to keep on providing services while they’re doing it. I think the “non” in Seth’s post relates to its own currency frankly – it’s an old bromide that’s getting kinda stale. It smacks of someone who knows the marketing and internet world very well, and the non-profit world barely. Diss non-profits for their marketing strategies by all means, but not for their lack of featuring in the top 100 on Twitter. Is that how we measure social impact now? Twitter & Digg? Seriously? One final thing; the post also tars all non-profits with the same brush, ignoring huge amounts of innovative work with web 2.0 and social media. 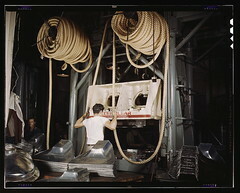 See http://www.socialbysocial.com or countless other examples catalogued by Beth and others. And one (other!) final thing: if he's that upset, I'd say focus that anger on helping solve it: help a non-profit achieve what he's talking about. Put the weight of his reputation and networks behind it. Create the marketing phenomenon he's talking of. It's easy to carp and point; less easy to make that change. Sorry to hear it didn’t resonate with you. I was actually overwhelmed with mail (about ten times more than I usually get) and every single piece from a frustrated person inside of a non-profit. Again, sorry that I’m stale. I’ll try to do better! Here’s another example: the non-profits I’ve given money to in the past (and you’ve heard of many of them) continue to spam me with direct mail tactics that are 40 years old. My point about VCs wasn’t that non profits should be raising money from them. It’s that we expect ‘real’ companies to be innovative risk takers, but somewhere along the way, the status quo for non profits has become to be boring. Change is hard for people and for people who work in nonprofits. Social media can also inspire timidness. Seth's painted a untrue picture of ALL nonprofits as deer frozen in the headlights. While there are many examples of nonprofits embracing social media and getting results with only a fraction of Ashton Kutcher's Twitter followers - there are organizations that are not engaging. If anything, Godin has got the attention of those who work in the nonprofit sector and are engaged in the social media conversation. Whether or not that is only a small percentage of the nonprofit field or not remains to be seen. Certainly the nonprofit field has made progress since 2006 - when Godin ranted about nonprofits being clueless. 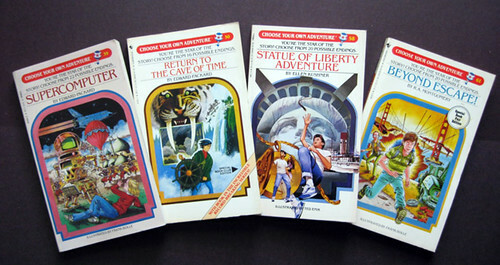 Choose Your Own Adventure is a series of children's gamebooks first published in 1979. Each story is written from a second-person point of view, with the reader assuming the role of the protagonist and determining the plot arc by deciding which page to turn to. That's the inspiration behind the new webinar format for WeAreMedia where you'll get to "Choose Your Own Expert" coming to you on September 23rd beginning at 10 am PST. This interactive webinar experience will begin with a plenary session providing an overview of social media strategy, organizational adoption issues, capacity, metrics, and strategy execution. We'll include a live question and answer and a back channel discussion with experts and practitioners sharing their expertise and knowledge. After a ten minute break, participants will have the option of joining one of four break out sessions: Listening/Engaging; Storytelling; Generating Buzz; Online Networking. Each of the 60 minute sessions will include a drill down in the topic area, presented by an expert in field (see below). The back channel will be moderated by even more experts, who will add additional insights and answer participants questions. After a ten-minute break, participants will reconvene as a group to grill the presenters in each of the areas. Goal: To understand how to use listening strategically and the tools and techniques required. This will cover monitoring and tracking tools. Goal: To understand how to use blogging and video blogging tools to strategically tell your organization’s story or get others to share the story. Goal: To understand how to use tools like Twitter and Digg to quickly and virally spread your organization’s messages. Goal: To understand how to use social networks strategically for communications and fundraising. This event is only $50 for NTEN members and you can register here. 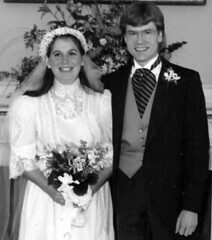 Twenty three years ago on this date (September 14th), my husband and I got married! We've been together for 29 nine years! I celebrated my 20th anniversary in Flickr and with this video (darn the gown doesn't fit this year!) There isn't any thing specific on the geek anniversary gift list to mark the 23rd, so we'll send a donation to the Sharing Foundation. Last year, I marked the date with the above photo and a post with tips for cultivating bloggers and how it was like a long term relationship. That post was one of my top ten posts for 2008! 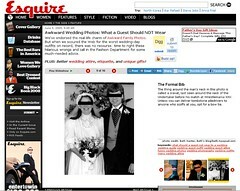 The original photo is on Flickr and caught the eye of an editor from Esquire Magazine who was looking for photos to illustrate a piece about wedding photos. They used it - with blindfolds over our eyes to illustrate what not to wear at wedding! The thing around the man's neck in this photo is called a cravat, last seen around the neck of the Undertaker before his match at Wrestlemania XXV. Unless you can deliver tombstone piledrivers to anyone who scoffs at you, opt for a bow tie. I got a cravat pitch this morning. It was from a nonprofit organization, a communications manager, who sent me the link out of the blue, without even a "Dear Beth," and really not saying much about why I would be interested. Even worse, hadn't made the attempt to comment on my blog or refer to any posts. In contrast, I also got a bow tie pitch. It wasn't really a pitch. It was a number of thoughtful comments on some blog posts. We got into some back and forth - and of course, it got me interested in writing about the topic. Plus, the person took the time to get to know me over time before asking me for anything. Blogger relations (not to be confused with blogger's relationships like I'm describing above) that is blogger outreach came up as a topic in a workshop I did on social media and the arts last year. So, here's some advice on how to not to pitch a blogger. 1. Don't have your office intern hapzardly send out a canned pitches, get to know the bloggers first. While I write about nonprofits and social media, I try to approach the topic with a bit of personality - and that means sharing information about me - like the fact I'm celebrating my 23rd Wedding Anniversary. So, why would someone send me a story pitch and press release and invite me to write about social network designed for women who are divorced? I got a good laugh before hitting the delete button. I got the impression that someone just scraped this list and send out pitches blinding without, at minimum, clicking through to a Facebook profile or perhaps evening reading the blog. So, before you begin blasting out your pitch happardly to bloggers, read some of what the blogger has written and see if your pitch is relevant. 2. Don't have your first point of interaction be a request to blog about your program or whatever. My husband didn't ask me to marry him on our first date - we had a great courtship, getting to know each other before we said "I do." The best first date with a blogger is to leave a meaningful comment on their blog. Something more than "this is great" or "write about my project," but something that leaves the impression that you've taken the time to read the blogger's previous posts and add something with your comment. Kevin Bondelli has more advice. 3. Don't overwhelm the blogger with requests. Once you've developed a relationship with trust and respect, then you can begin to pitch. But don't ask them to write about every little thing and don't swamp them with pages and pages of material. Be succinct and make a clear connection between what the blogger is interested in writing about and your program or organization or whatever your pitching. 4. Provide helpful information: If the blogger is going to write up a post, make sure you have a good "blogger" mini site or easily content. I can't tell you the many times I've been pitched with an attached press release without good pointers to online information. 5. Answer the Bloggers Questions promptly: This blog, like many blogs, is a labor of love. So, answering follow up questions promptly is very much appreciated. 6. Say thank you: If the blogger writes about your organization or project, it is a nice touch to say thank. I'm simply amazed that people don't do that. Best way is to leave a comment in the post. Don't send direct messages with "retweet" this, particularly if you don't know the person or don't have a relationship. I get a lot of DM and while I'd love to retweet all of them, I'm only one person. I tend to retweet when I have a relationship, as a reward, or when there was been reciprocity. If your pitch also has a request to retweet, include a copy of cut and paste examples. Make it easy. Saying thank you Twitter is easy with a retweet. What tricks or tips have you learned about approaching bloggers and getting them to write or Tweet about your nonprofit's programs or services? What are some of the best resources? The conference speakers are a veritable list of who is who in the nonprofit tech world and you get a free copy of "Managing Technology to Meet Your Mission." You can register here. I'm presenting on ROI and Nonprofit Technology on September 17th at 11:30 am. My presentation is based on Chapter 3 of NTEN's book. The chapter includes detailed checklists, case studies, and how-to steps for analyzing ROI for nonprofit technology projects. I'm going to start with a very brief primer on ROI which will provide a basic overview of the concepts. But the real learning (I hope) will come from a couple of ROI cliff hangers that I've created. Participants will apply what they've learned using the interactive features of the Webinar software to vote or suggest ways to resolve a common ROI problem that nonprofits typically face. So, think of the Perils of Pauline where each installment ended with Pauline placed in a situation that looked sure to result in her imminent death but was able to escape at the beginning of the next installment. I've created a couple of scenarios where IT staffers Paul or Pauline are faced with a typical ROI challenge. What's your biggest ROI cliffhanger? How have you resolved it? I've been participating in service days where I can share my technology skills with local organization. My favorite is the annual NTEN Day of Service for the NTC which I've been doing for the past ten years! Mozilla Service Week starts on Monday, September 14! The idea behind service is simple: Everyone should know how to use the Internet, have easy access to it, and have a great experience when they’re online. Mozilla is reaching out to geeks far and wide to give a helping hand to nonprofit organizations and people all over the world to experience the joy of using the Web! Here's an update from Mike Everett-Lane on the Social Actions blog about how the nonprofit tech community is supporting the event. 1. Choose from a list of service opportunities: Search Mozilla's partner sites (Idealist & betterplace.org) for a volunteer opportunity near you or anywhere around the world! 2. Take part in OneWebDay on September 22nd, which aims to celebrate and preserve the Web as an important commons accessible to everyone. This year’s theme is “Digital Inclusion” and there will be local service events that you can join! More information here. 3. Create your own opportunity: Reach out to a local school, organization or people near you to find out what sort of technology help they need. 4. Do a Internet Health Check: If you need an idea of how to help a local community, the good folks at Mozilla has lots of great ideas that are simple activities that can help make the Web better. The Internet Health Check offers a couple of easy steps on how to keep people safe on the Web. 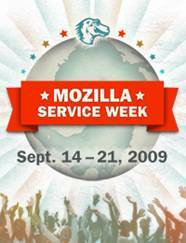 Mozilla Service Week has large bandwagon of nonprofit technology and technology companies providing support. Major names in non-profit technology, service and social entrepreneurship spaces have joined on as as “Friends” of the program to help promote Mozilla Service Week to the various communities that they serve which include schools, NPOs, NGOs and more. This includes Aspiration, The Extraordinaries, NTEN, PopTech, and many others. With President Obama declaring September 11th for the first time as a federally recognized National Day of Service and Remembrance, thousands of organizations around the nation are mobilizing Americans to engage in service and perform good deeds in observance of the eighth anniversary of the 9/11 attacks throughout the fall. This site, MyGoodDeed is encouraging people to pause and share their plans for a personal good deed. You can even add a good deed widget for your site. What are your plans for giving service to your local community this fall? Note from Beth: This post, Evaluation for Learning, was originally published as a guest post on the Good blog as a response to “How Might We Celebrate Learning through Evaluation?” Learn more about the conversation here. I'm republishing here because I think several of the principles for evaluation that Gale outlines are very important to approaching how you pilot, monitor, and improve your social media strategy over time so it has impact or ROI. I tweeted the link to the original and one colleague, Michelle Murrain, wrote a reflection called "Evaluation and Being A Learning Organization." I appreciated Sally’s post on the topic of active learning and the questions she has posed are similar ones we challenge ourselves with at the Packard Foundation. The comments of Sonal Shah (I wasn’t there at SoCap, but Beth Kanter was) resonate as well with our own work and approach to balancing the rigor of evaluation along with simultaneous commitment to continuous improvement. Through these principles we acknowledge that no effort can be successful without feedback on a continuous basis and without good data. This has to be done in the spirit of improvement and collaboration and with staff and grantees being allowed to make mistakes, to go in a wrong direction, learn from previous work, and take corrective action. It has to be done with the acknowledgment that it is the grantees that are doing the work and that the grantees have to be involved in that conversation. As a Foundation, we need to be aware that the burden of evaluation can be large and that we work to minimize the burden and maximize the value of evaluation for our grantees. Over the past four years we have been shifting from evaluation for proof or accountability (“Did the program work?”) to evaluation for program improvement (“What did we learn that can help us make the program better?”). The latter reflects an approach we refer to as “real-time” evaluation. For us, real-time means balancing monitoring and evaluation to effectively support learning and continuous improvement as our grant-making strategies are implemented. In practice, this extends further than evaluation, and represents our overall approach to an appropriate monitoring, evaluation, and learning system for each programmatic area. Real-time monitoring and evaluation are integrated to regularly facilitate opportunities for learning to occur and bring timely evaluation data—in accessible formats—to the table for reflection and use in decision making. Rather than focus just on evaluation, we have been encouraging a culture that “thinks evaluatively” throughout the grant-making lifecycle of planning, implementation, monitoring, assessment, and course-correction. We do not have a one-size-fits-all approach to monitoring and evaluation. Rather, we ask our program staff to consider the following factors when they are formulating their monitoring, evaluation, and learning agendas: What questions do we seek to answer? Who is the audience for this information? What level of rigor do they require to be convinced? How complex are the strategies? What is the timeframe for needing information? Finally, what are the overall program resources being invested? In response to these questions, the evaluation approach selected may range from retrospective to real-time evaluation or a combination of both, using qualitative and quantitative data, and loosely aligned or highly rigorous methods. We also encourage staff to consider their monitoring, evaluation, and learning needs at the beginning of a subprogram. We have found that doing so is more likely to lead to logic models, outcomes, indicators, and dashboards that are useful to informing decision making and program improvement rather than being requirements that are imposed on the subprogram with no connection to programmatic work. Making the shifts from evaluation for proof to evaluation for program improvement was greatly aided by practices that were already underway within the Foundation. Since 2004 our Preschool subprogram has been engaged with the Harvard Family Research Project in a real-time evaluation. The HFRP’s approach represented a new way of doing evaluation at the Foundation. The evaluation has in many ways been a strategic partner by serving as a mechanism for the timely flow of strategic information to facilitate the Preschool subprogram’s development. From the start, its emphasis has been on continuous (or real-time) feedback and learning. Because the strategy relied on advocacy and policy change, for which there were practically no established evaluation methods, the evaluation also required methodological creativity. Traditional evaluation approaches in which the evaluator develops an evaluation design and then reports back when the data are all collected and analyzed, or in which the evaluator assesses impact after the strategy has been implemented, would have been less useful here. The importance of these practices may sound self-evident, i.e., everyone should do these, but they are much harder to actually carry out. Not everything has worked as planned in these evaluations, but both program staff and the evaluators have become skilled at adaptation. The evaluation field has room for growth if more evaluation is going to be real-time. Evaluators themselves are learning how to be both rigorous and faster. 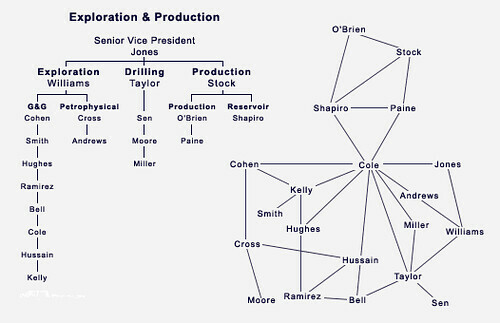 I like what IDEO is doing in this space. I think it is just the kind of integration of evaluation rigor, rapid cycles, and continuous feedback that many of us are looking for to build into our practice. Much has been made of the distinction between evaluations designed for accountability (determining whether a program did what it said it would do) and evaluations designed for learning (supporting ongoing decision making and continuous improvement). In truth, evaluations rarely are either one or the other. Typically they must be both (e.g., a program officer may be more interested in learning while a board member may be more interested in accountability), and the evaluation must find a way to ensure that both users’ needs are met. Balance and feedback are key here. How can we get the highest quality information we need, when we need it, to make the best program strategy decisions without undue burden of reporting among those we rely upon for data? And while we might have these good intentions within the Packard Foundation, they will not mean much if they don’t translate into real value, that is, impact. At the forefront, our focus is still on the key questions: What are our goals or outcomes we want to achieve? Are we meeting them? It is the real-time aspect that allows us to better know if we are making progress towards those outcomes, what is contributing to our progress (or lack of it), and therefore how to make better strategy decisions along the way. Guest blogger Gale Berkowitz directs evaluation at the David and Lucile Packard Foundation. Note from Beth: Last May, Mark Pescue published a provocative essay called the "Tower and the Clouds" which talked about the tension between working in traditional, hierarchical nonprofits and the "cloud" like behavior of working with social media. Much of the my reflections and noodling on this idea has been around how existing nonprofits balance these two approaches. But what about those freeagent activists who have worked outside of the formal structure of a 501c-3. Should they establish a nonprofit for their work to support growth? Could this be a new type of nonprofit or not? I asked this question of Manny Hernandez, founder of (TuDiabetes.com in English and EsTuDiabetes.com in Spanish). His online communities are the most tech-savvy of the independent diabetes communities: Hernandez built it on social networking platform Ning, the company at which he worked before starting these online communities and his nonprofit. As of today TuDiabetes has almost 10,800 members and EsTuDiabetes has almost 5,400. Manny answered my question with a fantastic post titled "How To Create Social Change Without Forming a 501-c3" to run as a guest post on this blog. It's filled with good advice on this topic. In a follow up email, I asked him to share his story and describe the benefits and challenges of being a 501-c3 created in the social media cloud. We started our communities in 2007, more than a year before we started the nonprofit. We decided to become a nonprofit in early 2008 and formed the Diabetes Hands Foundation in April 2008. I wasn't familiar with the concept of a fiscal sponsor at that point (Heck! I wasn't familiar with SO many things back then -and I learn something new about nonprofits almost every day): I would have probably otherwise pursued a fiscal sponsorship much earlier. People have a natural tendency to fear relinquishing control and that can be a barrier for some people who could otherwise benefit a lot from working under a fiscal sponsor. In tough times like this, it's so critical to focus on the core of your mission that any support you can receive, such as the one that comes with being a fiscally sponsored project as explained in the interview with Melanie, is something to consider very seriously. Working as a nonprofit with an active presence in the social media cloud comes with its benefits. One of the benefits of being a nonprofit is the support you get from people: whether it's financial or emotional - something as simple as retweet of your message on Twitter. When people sense that you are working for a good cause without the goal of making a profit, they come forward and help. That is incredibly fulfilling: almost as fulfilling as seeing a testimonial from someone whom your community has been able to help. And because of the ease of taking action in social media (whether it is through posting a comment, making a micro-donation or sharing something with you friends), the ability for people to help your organization grows exponentially. One of the things that can get in the way when you work as a nonprofit is that you need to be much more mindful of who you partner with and how you partner with them. Since we started as a nonprofit, lots of groups (some nonprofit, some for profit) have approached us with ideas, projects, etc. to partner around. Typically we embrace most nonprofit proposals we receive to some extent (we can't obviously be all things to all people) but when we're approached by a for profit group, we need to assess the social benefit that our members and all those affected by our work would derive from us partnering with such a group and we need to partner in ways that are central to our mission as a nonprofit (to connect people touched by diabetes and raise diabetes awareness) while we are careful not to endorse or promote products or services. Given the acknowledgement by business at large of the importance of social media as a means of getting the word out about their products and services, nonprofits that are or are becoming social media savvy need to be mindful of this, to avoid making unnecessary and costly mistakes. How can you create a safe place for hands-on learning from social media pilots? 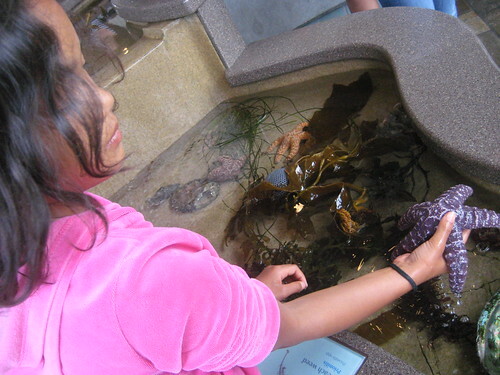 A few weeks ago, we drove down to Monterey for a visit to the Aquarium. The kids loved, especially the hands-on exhibits. What better way to learn about a starfish than to pick up and hold it in your hands. My daughter was scared at first, but after learning that the starfish would not bite, she tentatively dipped her hand in the pool and picked it up. She had a safe place for hands-on learning. This morning I had the opportunity to participate in a discussion at the Community Roundtable hosted by Rachel Happe and Jim Storer. The participants were from corporations, but the issues are creating a culture that isn't afraid to fail are the same for many nonprofits, particularly larger organizations. One of the key takeaways was the importance of hands-on learning through pilots and careful experimentation. What makes people nervous or creates a kind of "stage fright" is the learning in public. 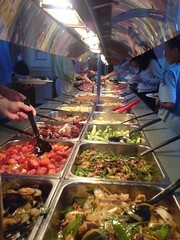 Participants suggested the need for providing a safe place for hands-on learning and that the experience is scaffolded. It is important both as an organization and for one-on-one coaching. I thought about the discovery pools and hands-on learning exhibits at the Aquarium. How is your organization providing a safe place for piloting social media strategies? Note from Beth: Simplicity is a good thing and it's been a theme of the book I'm co-writing with Allison. The array of social media can appear to be very complex. But social media and social networks respond to the same needs that drive people; the need to connect with one another in meaningful ways through conversation. Social change happens through conversations, and the job of nonprofits is to organize themselves in such ways as to catalyze and manage those conversations. It's about letting go - the staff or the organization doesn't have to do it all. It's also about having the ability to stop doing programs or activities that don't work. It's also about streamlining decision-making and being more nimble. A few weeks ago, I asked for your stories about how organization's simplify or are designed to be simple from the get go. This post, from David Venn, was one of the responses. I’ve been a communications professional in the field of adolescent mental health for over two years now. The way I think about audiences and communication has been transformed due to a better understanding of the concept of simplicity. I realized that I could listen to other organizations working on adolescent mental health, build relationships, collaborate, and ultimately reach more people with less effort. My communications efforts were focused solely on getting our audiences to see what we were doing; visit our website; listen to our message. I was acting like a self-absorbed three-year-old on a trampoline – “Look at me! Look at me!” Sure I was communicating, but the result was that few people were listening. Armed with a better understanding of social media and the tools, I realized I didn’t need to blast out our message to everyone at once all the time. I started listening to youth, parents, and health professionals already using the social media who were passionately engaged in our issues, not necessarily our organization. I also discovered that I could use listening to build collaborative connections to other organizations via the social web, both locally and nationally. I no longer felt alone. I was working with an informal network of organizations that had resources and reach beyond our organization’s capacity and were also focused on our same issues. I learned that if other groups were pulling like us, weren’t we all just playing a big game of tug-o-war. So I dropped the rope and started pushing. I became less concerned with the content that I was creating and started listening to the conversations that our audience and similar organizations were engaged in. I put less emphasis on one-way communications like websites, newsletters and press releases, and focused on more two-way mediums like blogging, Facebook and face-to-face exchanges. I also set up RSS feeds and bookmarking tools to monitor the work of other organizations I was interested in. Instead of trying to find ways to “pull” other people and organizations to into our world, I began to focus on how I could “push” youth mental health into theirs. I stopped communicating and started collaborating! I began to explore innovative ways to integrate our message with the work of other organizations I discovered through listening, even those that were not directly connected to youth mental health. For example, our team partnered with the ViewFinders International Film Festival for Youth and started an animation camp that allowed young people to create films about mental health problems. The films were premiered at the festival and we shared the animation creations on YouTube and through our blog. Our team also worked with the Mental Health Commission of Canada to develop a youth mental health strategy. Through our shared networks we developed a community on Facebook for people who were passionate about youth mental health and who wanted to share their values in the creation of a policy document. In addition to feeling a new found excitement about connecting with other organizations through the social web, we are developing, our approach also has another unexpected benefit – simplicity. That allows us to work in this networked way. We don’t have to do all the heavy lifting. We’re able to accomplish much more than by operating in a silo. We are able to focus on what we know best – youth mental health – and our partner organizations bring their best assets to the table. What organizations can you engage in that you haven’t already explored? What are they doing on the social web? How can you work together? What unique resources does your organization have that you can share with your partners? How can you simplify your communication efforts by using social media? How can you start to make the shift from “me’ to “we”? David Venn works as a Communications Advisor with the Sun Life Financial Chair in Adolescent Mental Health where he is dedicated to enhancing the mental health and well-being of young people.